Find Pennsylvania dinner cruises that are great for romantic getaways or fun weekend getaways with the family! Enjoy the best dinner cruises PA has to offer at a series of locations throughout the wonderful state. Great Dinner Cruises in PA for the Whole Family! Cruise the lovely Susquehanna River as you enjoy a sumptuous buffet, when you board one of Hiawatha's wonderful riverboats! Check the website regularly to keep updated on the cruise schedule. 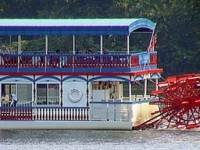 All cruises set sail from the dock at Susquehanna State Park and usually last from 6 to 7:30 P.M. Adult beverages are available. Reservations are required. Hiawatha also offers public, brunch, Wing Night, karaoke, kids' karaoke, family night, Quizzo, Murder Mystery, Cinco De Mayo, Halloween, and concert cruises. Private charters are available on a first come, first serve basis. To book a reservation or request additional information, call 570-326-2500 or 800-248-9287 today!